more to them than ever before. Aside from communicating with your customers regularly, and advertising your products/services, you need good business signage to attract new customers and to increase your brand exposure. When people pass by your business, it’s vital that they know you are there and what you do. business. Nearly 8 in 10 people will enter a store or business they have never visited before based solely on their signs. This comes from a survey conducted by the Economic Center of the University of Cincinnati. What do your signs say about your business? fective signs is best left to the experts. Once you visit our shop, you’ll understand why. We have the tools and the knowledge to create any custom sign for you. ook to professional, custom signs. After your initial investment, maintenance costs are very low. There are many ways to spend your advertising dollar when you own a business. Custom business signs are tried and tested. They are there for you 24/7, no matter the weather. Even when your business is closed, your custom sign is still working for you. Unlike almost else you do in your business, no extra effort is required by you or your staff. Isn’t that nice? Window graphics are a unique way to advertise your business. We have the latest in vinyl window graphics and lettering to draw in new customers. If you would like to read more about why exterior window advertising is great for your business, check out this link and see how it all worked out for this company. A custom building sign will give your business the standout status it deserves. The nice thing about custom building signs is that you can create one that’s a perfect fit for your business. d. It’s all up to you. Our custom colors, shapes and sizes are all yours, awaiting your choices and approval. 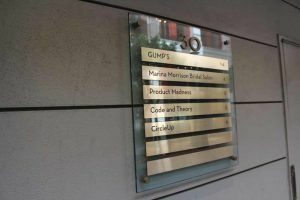 Be sure to click here and learn about this particular company and how a custom building sign worked for them. When your business relies on people getting from one area to another, good wayfinding signs are a must for your business. No one likes feeling lost in a parking garage, museum, library or shopping mall. That only happens because wayfinding signs are not there or they are inadequate. Make it easy for visitors to have a good experience, however, and they will return the favor by coming back for more. Creating a consistent message with wayfinding signs is one of the most important, and often overlooked, things you can do. Here’s an example of wayfinding signs we made and why. Your business lobby is essentially the face of your business. What is it customers see upon first entering your lobby area? Are your lobby signs warm and welcoming or do they say nothing at all? What you communicate through signs says everything about your business, so make the design of your signs intentional. Make a great first impression with custom lobby signs. You have so many options to work with, including dimensional, engraved, illuminated, backlit, freestanding, walls, plaques, and graphics. We can create all of these signs and more using your exact logo colors and branding style. For more information on what a lobby sign can do, go here. Let your business be the best it can be. With custom signs, you will rise above the crowd. Let us show you how it’s done. Give us a call at (818) 349-7400.